RME’s successor to their popular Babyface audio and MIDI interface is finally available. Does it live up to the company’s usual high standards? Five years later, RME were back at Musikmesse to unveil the Babyface Pro, which is very much an evolution of the original product. The build quality and front panel have been improved, but it’s still unmistakably a Babyface. The interface finally started shipping in late 2015. So, without further ado, it’s time to meet RME’s latest baby. The packaging for the Babyface Pro is sleek, and the unit itself is presented in a fabric pouch that sits firmly in a hard-plastic case. The case also contains USB and MIDI breakout cables, and is intended as a microphone-style travel case since the Babyface Pro, with its demure dimensions, is obviously rather portable. The packaging also includes a driver CD (although downloading the latest driver from RME’s web site is usually the best first step) and a printed manual in both German and English. A full printed manual! In 2016! One accessory that isn’t supplied in the box, however, is a power supply, and that’s because the Babyface Pro, like its predecessor, is bus-powered via the USB 2 connector. However, the interface does have a DC connector should you need to power it by other means (see the ‘We All Stand-alone’ box), and the case seems to have a space reserved for such an adaptor. Getting the Babyface Pro up and running was a piece of cake: simply install the drivers and plug it in. I’ve always considered RME’s drivers the gold standard to which others are compared, and I encountered no problems while playing around with Babyface Pro — which isn’t bad considering I was running relatively new hardware (a Surface Pro 4) with Windows 10 Pro. In fact, in addition to supporting the latest operating systems, RME provides impressive legacy support. The Babyface is compatible with all 32- and 64-bit versions of Windows from XP (with Service Pack 2), and Intel versions of OS X as far back as 10.5, which is more than can be said for many of RME’s competitors. As with all RME interfaces, two pieces of software will be installed alongside the driver that are accessible from the Notification area on Windows’ Taskbar, or via OS X’s Dock. The first is a Settings panel, where hardware-level configuration takes place, such as setting the buffer size, sample rate, or clock source. The second application is TotalMix FX, which provides access to the FPGA-powered DSP mixer. The Babyface Pro’s internal processing ability is the same as before, which initially seemed a bit of shame: three bands of EQ plus low-cut per channel, with a send control to the global reverb and echo effects. This means you’re missing the per-channel dynamics and auto-level controls from TotalMix FX implementations found on RME’s newer interfaces. However, in order to make it possible for the interface to remain bus-powered, it’s likely RME had to carefully consider anything that would impact the unit’s power requirements. Already, the Babyface Pro requires 100mA more than the 500mA specified in the USB 2 specification, although this isn’t going to be a problem for most people as the majority of USB 2 ports generally supply more current than the specification requires. Since TotalMix FX has been covered many times in previous reviews of RME’s interfaces, I’m not going to discuss its inner workings here. However, this was the first time I’d used TotalMix FX on a computer with a high-PPI screen, and so I was shocked when I first opened it and all the controls were strangely Lilliputian! Surely RME have thought about this? And indeed they have: you can select either 100 (the default), 135 or 200-percent magnification from the Windows menu if your system has such a screen, although it would be nice if TotalMix FX chose an appropriate scaling by default. The Babyface Pro does away with the breakout cable of the original, with all connections located on the rear and sides of the unit. Unlike the original Babyface, where most of the audio and MIDI connectors were attached via a single breakout cable (which connected to the interface via a 15-pin D-sub), only MIDI input and output are accessed with a breakout cable on the Babyface Pro. This is obviously a big improvement, since large breakout cables can be a pain in the proverbial. The two main pairs of XLR female and male connectors for analogue input and output are now at the rear of the unit, with the USB, DC, MIDI and Toslink connectors having been relocated to the left-hand side. One small point about the female XLR connectors is that they’re not lockable, and although the connection is reasonably tight, a cable could conceivably be tugged out. Finally, there are now two instrument inputs on the right-hand side, along with both 1/4- and 1/8-inch headphone jacks, which is a nice touch, offering separate driver stages for low- and high-impedance headphones. As with the original Babyface, the Pro’s front panel is dominated by the rotary encoder, which controls the level of the main output by default. This is accompanied by two large buttons: a multi-function Select button, and a Dim button that dims the main output. On the original unit you would push the encoder to dim the output, and there was a Recall button to set the output volume to a user-defined level. Since the encoder on the Babyface Pro is no longer a button, the Dim button replaces the Recall button; however, the recall functionality is still available by pressing and holding the Dim button for two seconds. New to the front panel are four smaller buttons above the encoder, along with dedicated in and out LED metering. By pushing the In and Out buttons, you can switch which input or output pair is being monitored: the main XLR pair, the instrument inputs or headphone outputs, or the optical connection. Depending on whether the In or Out button is lit, the encoder will adjust the level of the selected input or output pair. And, if you hold down the Select button whilst adjusting the encoder, you can adjust the stereo balance — should you want to. Some of the buttons on the front of the Babyface Pro can be configured to perform different actions in TotalMix FX. Here, I’m reconfiguring the behaviour of the Dim button. In between the In and Out buttons are two additional buttons labelled ‘A Set’ and ‘B Mix’. The Set button is used to define the level to be recalled when you use the Recall functionality: with the desired level set, simply hold down the Set button for two seconds. The same button is also used to switch between ADAT and S/PDIF modes on the optical output: with the Optical output selected, press the Set button and then use the Select button to switch between ADAT (eight LEDs illuminated) and S/PDIF (two LEDs), pressing the Set button again when you’re finished. 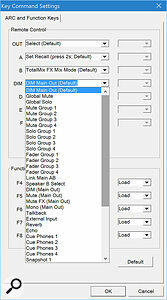 The Mix button enables you to adjust the routing of hardware inputs to outputs, without having to use the TotalMix FX software — although, frankly, TotalMix FX is a pretty easy and efficient way of doing this. Use the Out button to select where the signal should end up, use the In button to select the input signal, and press the Mix button. The input level LEDs will flash, and you can press the Select button to choose between left, right, and both channels, using the encoder to set the level. The reason the ‘A Set’ and ‘B Mix’ buttons are labelled this way is because the actions they perform are user configurable. 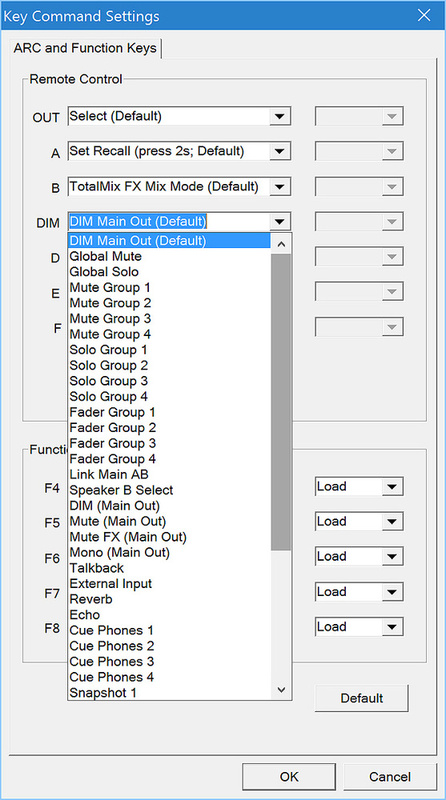 Borrowing some functionality from RME’s Advanced Remote Control, where these shortcut buttons were first introduced, this allows you to assign a number of TotalMix FX commands to these buttons, such as mute, recall of a certain snapshot, and so on. To do this, simply choose Key Commands from the Options menu in TotalMix and select the required command via the appropriate A or B pop-up menus. You’ll also notice that the Out and Dim buttons can also be reconfigured: the Dim button is fully configurable, while the Out button can act either as an output select button (the default behaviour) or as a ‘switch to speaker B’ button. One thing to be aware of, though, is that even if you reconfigure the ‘A Set’ button, some aspects of the default behaviour will remain. For example, if you press the Set button with the optical out selected, you will still activate the ADAT-S/PDIF selection mode as well as your user-defined action. The Babyface Pro features RME’s latest generation A-D and D-A converters (offering a signal-to-noise ratio of 117dBA) and mic-preamps, which feature phantom power as before, and now a pad option that can apply 11dB of attenuation and also increase the input impedance. To evaluate the inputs, I recorded some mandolin (don’t ask) with a DPA 4011-TL. RME have always opted for clean rather than colourful when it comes to converters and preamps, and the results were as clear and pristine as one would both hope and expect. I had no complaints about the outputs either, and the headphone outputs had plenty of level — a problem some users experienced with the original Babyface. After playing around with the Babyface Pro I found myself coming to the same conclusion as Dr Inglis: what’s not to like? The available I/O is perfect for an interface of this kind, the quality is great — both sonically and aesthetically — and the class-compliant mode is useful if you want to use it with more than just devices running OS X or Windows. Yes, it would be nice if the Babyface Pro could provide power to an iOS device, and maybe locks on the input XLRs would have been helpful; but it’s always a good sign when any criticism of a product falls into the category of nit-picking. In closing, in order to write this review a friend loaned me his new Babyface Pro, since this proved the easiest way to get one into my hands. All I can say is that, while I value his friendship, I don’t want to give it back. As great as the Babyface Pro is, it’s not the only interface aimed at this part of the market, and there are other options you might want to consider. 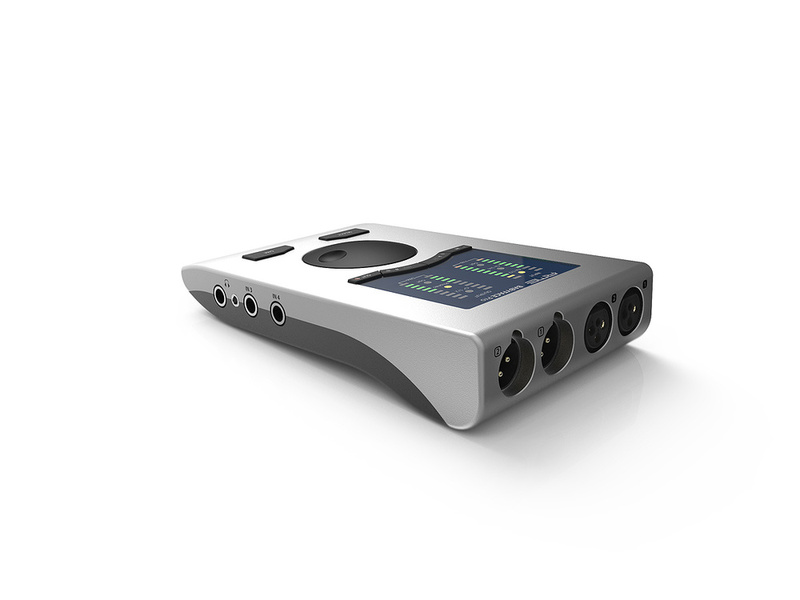 To start with there’s Apogee’s Duet, which is similar to the Babyface Pro, but slightly cheaper and one of the few interfaces able to power an iOS device. However, it only provides two inputs (with mic preamps) and four outputs, lacks optical I/O and on-board effects, and is only compatible with OS X and iOS. A second version — Pro Tools Duet — is available through Avid. This supports Windows at the expense of iOS and is sold with a copy of Pro Tools. Alternatively, if you want an interface with more enhanced effects, there’s Universal Audio’s Apollo Twin Duo, which is more expensive and available in two versions for Mac and Windows users. The Mac version features a Thunderbolt port, and a separate Apollo Twin Duo USB version offers a USB 3 connector instead. There are two inputs (both with mic preamps) and six outputs, but the real draw here is that it gives you the power of a UAD 2 Duo, which means you can incorporate DSP into your signal flow for tracking or run UAD-powered plug-ins in your host software. The Babyface Pro offers more than just the normal ‘personal computer’ mode of operation, as described in the main text. It can also be used stand-alone, or you can switch to a class-compliant mode that allows the interface to be used with a wider range of devices than supported by the standard drivers. Stand-alone mode is fairly straightforward — you simply turn the unit on with an external power supply, without having it connected to anything else. 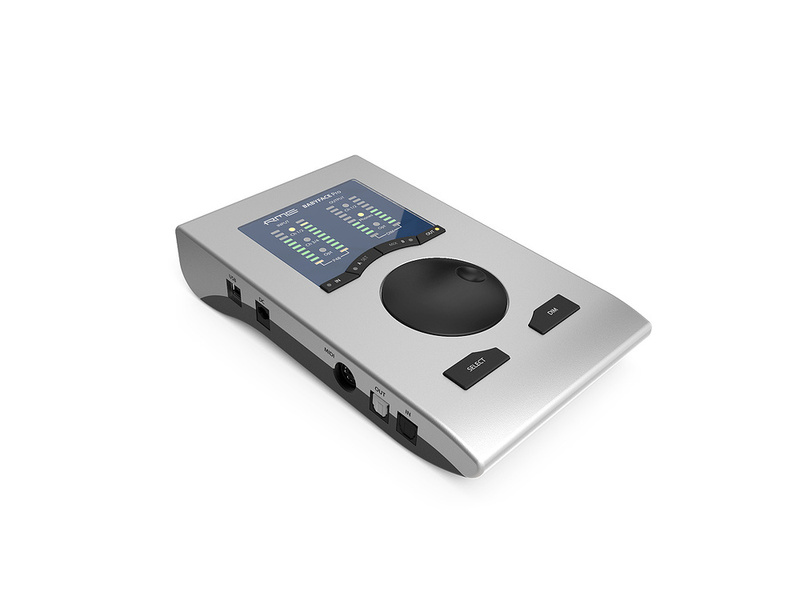 The Babyface Pro will default to 44.1kHz and will synchronise itself to an incoming signal from the optical input, although you can change the internal sample rate by holding down the Set button for two seconds. Similarly, you can control most of the device’s features from the front panel, as described in the main text, allowing you to use the interface as a converter or preamp, for example. Since the Babyface Pro doesn’t have any memory (or, really, any suitable hardware controls) for EQ, this is unavailable in stand-alone mode, although RME describe a work-around in the manual. Set up the EQs in TotalMix FX with the interface connected to a computer, then connect a power supply to the Babyface Pro and unplug it from the computer. 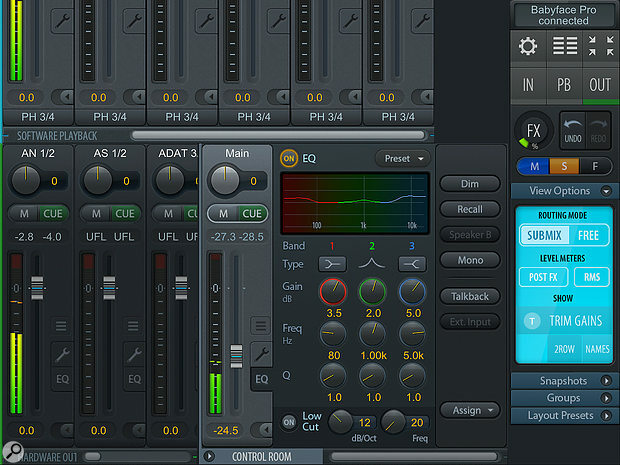 The mixer will retain its current state, although the EQ will be lost if the interface loses power. To put the Babyface Pro into class-compliant mode, hold down the Select and Dim buttons until the level meters show CC. Now, every time the unit is powered on subsequently the meters will flash CC to remind you the interface is in class-compliant mode. To return it to normal, hold down the same buttons again until the meters show PC. Here’s the iPad version of TotalMix FX, which allows you to control the Babyface Pro in much the same way you can with the desktop version. Class-compliant mode allows the Babyface to be used with an iPad running iOS 5 or later (or an iPhone running at least iOS 7) via Apple’s Lightning to USB Camera Adaptor. And RME even have an iPad version of TotalMix FX that functions almost identically to the desktop version, providing access to the effects controls and various other settings. The app is available for £2.99$3.99 from the App Store, which I think is a little bit cheeky given that, while it won’t break the bank, you have just paid £559$749 for the Babyface Pro. 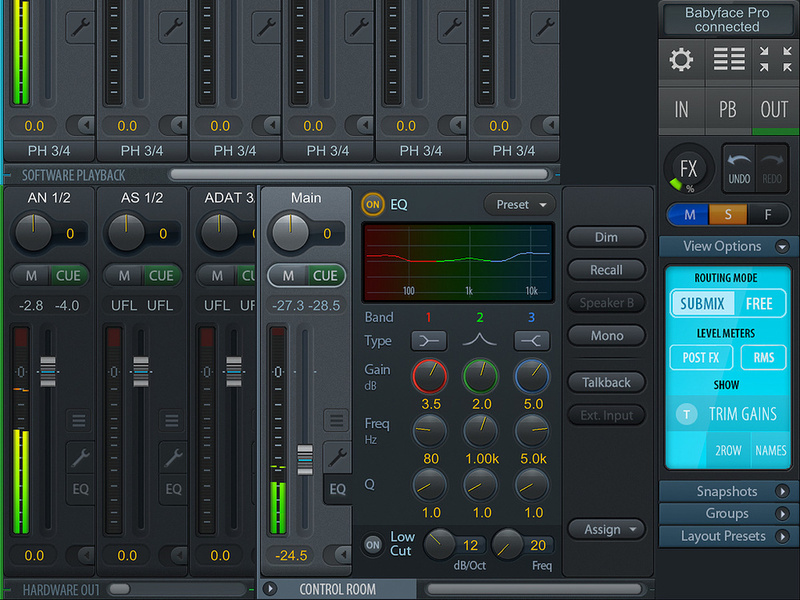 You don’t need TotalMix FX for iPad to use the Babyface Pro with an Pad, but it’s nice to have all the same. One reason it’s nice to have TotalMix FX for iPad is because of a setting in the app that allows you to force the Babyface Pro into multi-channel mode. This should happen automatically, in theory, when an app wants to use all the available inputs and outputs, such as Cubasis; but I encountered a problem where although Cubasis would show all the inputs and outputs, only the first two channels of each were actually active. Eventually, I found the ‘Output Channel Count req’ setting in the iPad version of TotalMix FX, which is set to No Preference by default, leaving iOS to switch into multi-channel mode as required. However, you can override this by changing the setting to either Stereo or Multi-channel. Once I changed this setting to Multi-channel, all inputs and outputs worked as expected. Looking in the help document built into the app, I then found that — surprise, surprise — this setting existed to solve exactly the problem I was having. After this I had no problem using the Babyface Pro with apps like Cubasis and Auria Pro, and the MIDI ports also worked as expected. The biggest problem in using the Babyface Pro with the iPad is that, like many other interfaces, the Babyface Pro can’t provide power to the iPad. This obviously limits its usefulness, since you’ll only get one charge’s worth of work done with the interface connected, which seems a shame. 12 input and 12 output channels. Two balanced XLR analogue inputs, each with a mic preamp. Two unbalanced TS jack inputs. Two balanced XLR analogue outputs. Two headphone outputs (one 6.3mm TRS jack, one 3.5mm TRS jack). Optical S/PDIF or ADAT (with S/MUX and S/MUX4 support). Solid build and sound quality. All of the great features you’d expect from an RME interface. Excellent drivers, with support for older operating systems. Cannot provide power to an iPad, even when a power supply is connected. The Babyface Pro is another outstanding interface from RME, offering pretty much everything you’d want in a desktop audio and MIDI interface. RME Babyface Pro (driver version 1.090, hardware revision 101). Microsoft Surface Pro 4 with an Intel m3 processor and 4GB memory running Windows 10 Pro. 2 weeks 19 hours ago. My DI signal is out of phase!